We’re getting used to the mud slinging between virtualization vendors and their respective marketing & communication departments, which are often publicly available for all to watch through blogs etc. Now niche publishers covering the world of virtualization are getting in that particular game, too. In the red corner, we have Keith Ward, editor of 1105media‘s Virtualization Review. In the blue corner, James Hamilton, consultant and blogger for SYS-CON. At stake: the title of the first (only?) magazine to write exclusively on our beloved topic of virtualization. 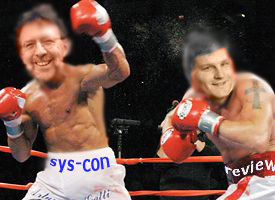 This sparked Keith Ward from Virtualization Review to call SYS-CON outright liars on his blog. “I have no problem with competition. I think it’s good for Microsoft, VMware, Cisco and AT&T. It’s just as good, and healthy, for IT publications. I do have a problem, however, with publications that either a) Outright lie, or b) Are woefully ignorant, and don’t check facts before they publish something. SYS-CON blogger Hamilton struck back with a vicious post calling for the firing of Ward as editor of Virtualization Review, and wonders if he’s on drugs. “SYS-CON Media, the world’s leading i-technology media company, has been publishing Virtualization Journal for the past three years at www.virtualization.sys-con.com – long before your publishing outfit expressed its intentions to cover the virtualization market last November and long before they hired you as an employee. Hamilton goes on to make fun of an event organized by 1105 Media that had a small number of attendees. We’re not going to pick sides here, but we certainly wish there was a little more maturity on display. Virtualization is a hot space, there’s plenty to say about it, and it’s natural that there are multiple publications about the subject competing against each other. Get off your high horses and cater to your readers as good as you can instead of bashing each other. We enjoy reading both of you and will continue to do so, but please drop the cheap, pointless accusations because it doesn’t benefit anyone. My understanding is that James Hamilton isn’t even a real person. I know James Hamilton very well, there are rumors that I am not a real person either, but it is not true, we both exist as real people. JAmes Hammilton sonuds like a real jerk. Keith ward didn’t do anything wrong, sounds like to me. It sounds like James Hammilton, if he’s even real, is the one whos being immature.